They don’t call her Stormy Monday, but come on. If she’s going to pick a stage name beginning with Stormy, I would like to express my preference for “Monday” rather than “Daniels” as the last name. 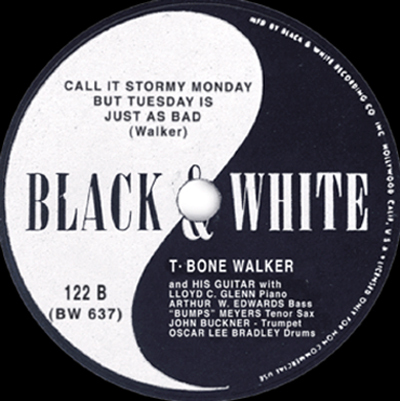 “Stormy Monday” is one of the great blues songs of all time. Composed by Aaron Thibeaux “T-Bone” Walker, the song was released as a single b/w “I Know Your Wig Is Gone” (or vice versa) in 1947 on the Black & White label. Walker was born in Texas in 1910; he died in 1975. The authorities inform us he was part black and part Cherokee. His aunt gave him the nickname T-Bone. Even his recording labels had good names. Rhumboogie Records, for example, named for the Chicago club, was one of his early labels. T-Bone was an incredibly influential musician. Bill Dahl tells his story in the excellent Allmusic profile. Walker’s electrification of the blues was influential; his guitar playing was influential; his singing was influential; his theatrics were influential. And in “Stormy Monday,” he wrote an inexhaustibly rich song. It must have been covered in hundreds of recordings, by roughly every artist who loves the blues. The song is a chronicle of the working man’s week with a lament for lost love to fill it out. The week is pretty much a drag until payday, though Walker says it figuratively. Payday is Friday, when “the eagle flies.” The singer looks forward to putting “the eagle” to good use on Saturday and then repenting on Sunday. There must be a life lesson in there somewhere. This is the way the composer himself laid it down. Bobby “Blue” Bland recorded a tremendous version of the song in 1962 in which he changed up the arrangement by substituting a few chords. Giving a glimpse of the song’s adaptability to different styles, Lou Rawls served up a silky smooth reading with Les McCann backing him on piano. If it weren’t Lou I would give this version a pass. The Allman Brothers harked back to T-Bone Walker and Bobby Bland in their reworking of the song live at Fillmore East. They respect their forebears, but they stake a claim to the song too. We shouldn’t overlook the great Albert King. He loved the song. The live performance below gives us King with Stevie Ray Vaughan in a kind of fathers and sons pairing. Eric Clapton has recorded the song several times, going back to his stint with John Mayall and the Bluesbreakers in 1966. These recordings are all worth searching out and listening to, perhaps in conjunction with the documentary Eric Clapton in 12 Bars that is currently in rotation on Showtime. When Cream reunited as 60-something gents in 2005 for a run at Albert Hall, Clapton seems to have reached for a defining performance. I may be wrong about that, but I think he certainly makes a statement of his his own with it.